1. Rinse the rice for 3 times or until rinse water is clear. 2. Add water and rice into pot, smooth it out evenly. 3. Cover with lid and cook over medium heat for 4 minutes. 4. Open lid and stir to avoid sticking, cover and cook for 2 minutes. 5. Lower heat to medium low to almost low heat, cook for 14 minutes. 6. Heat off. Let sit for 5 minutes with lid on. Done. 2. Water to Rice Equation: 1:1. For example: 3 cups of rice, add 3 cups of water. 3. Different brands and types of rice tend to have different water absorbency, it may take a few tries before you get the perfect water to rice ratio. 4. If the rice is too dry or even raw, add a few tablespoons or up to 1/2 cup of water, extend the cook time a little long (may be 5 minutes) and let it covered for another 5 minutes. 5. 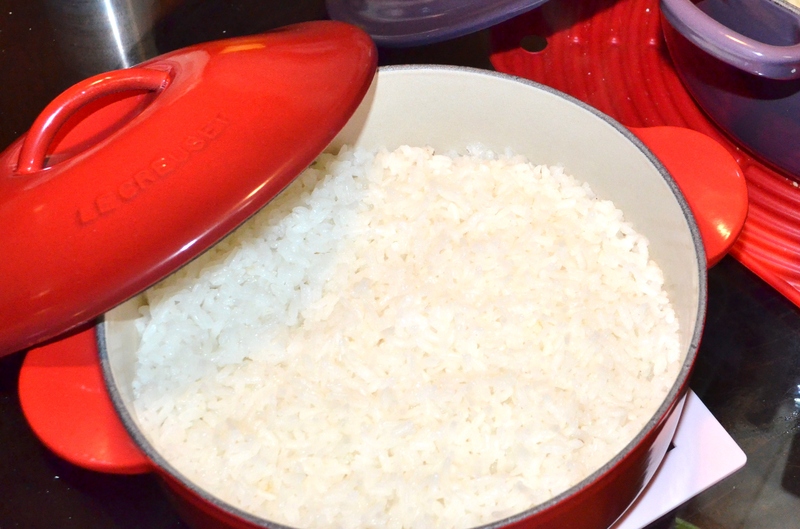 If the rice is too wet, open the lid and let it cook for a minute or 2. Rice that is way too wet can serve as thick congee, a tradtional Chinese food, consistence is range from soupy to very wet rice (like risotto). Try reducing the amount of water by 1/4 cup next time. 7. For more servings, increase cook time by 1-2 minutes per 2-4 serving, vise verse. Make sure to use a pot/pan that is about twice the size of the volume of pre-cook rice and water, that will help the rice cook just right. 8. Use a rice cooker or pressure cooker, add the rice and water, press the cook button and it will be done without worries.